Did you already import your script, and want to find out how send sides to talent? We make it a snap to create and share sides, keeping your actors up to date, and saving you the hassle of having to open up another program. To achieve this, you would simply apply a filter on your Shooting Script page. Click print or share to send it out. Can I remove scenes from sides? Yes you can include or remove specific scenes from sides. You can filter by scene, character or days. Will I be able to print or share my script sides? Yes, you can export or print sides foreach character separately, or for your Scenes. Can I watermark the script sides? Currently, this option is not available. If this changes, we'll announce it on our Product Updates page. Why aren't page numbers or days appearing on my shooting script? The reason why the "Day" dropdown is not appearing on your Shooting Script page is because there aren't any Day Breaks added to your stripboard. After adding atleast 1 Day Break, revisit your Shooting Script page and you'll notice the Day dropdown. How do I customize the ordering? 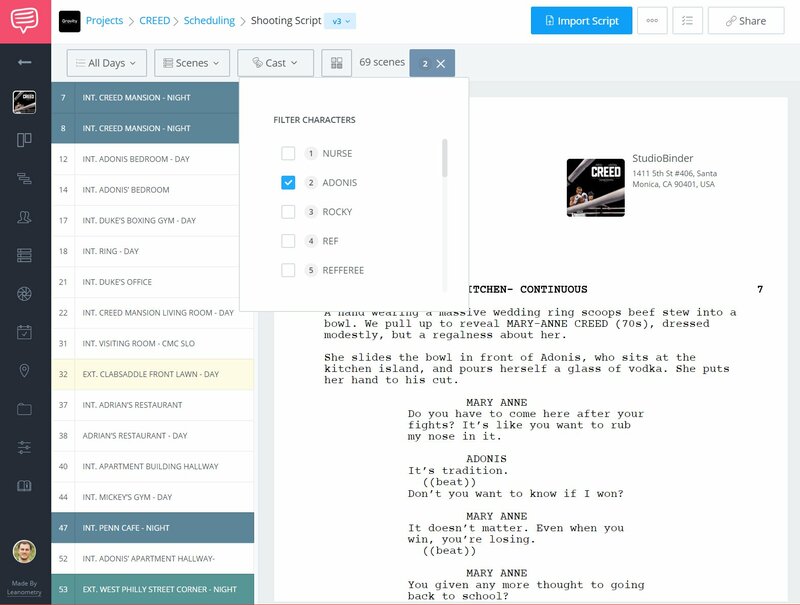 Currently, the Sides functionality will show you the shooting script in script order. However, you can easily filter based on the Scenes or Characters. Best Practices when working with sides. To avoid confusion, wait until you have the final draft of the shooting schedule imported before creating sides. This makes sure you don't share an outdated script with your talent. You can always attach the complete screenplay to your call sheet if you need to send more than just the sides to a client or producer. Finally, learn how to share a page.